Firearm magazine capacities are controlled by law in Canada since 1993 under provisions of Bill C-17. Magazines that exceed the defined legal capacity are classified as a prohibited device in Canada. Possession of a prohibited device is a criminal offense for any individual in Canada (this does not apply to properly licenced businesses). Semiautomatic handgun magazines in Canada are limited to a maximum 10 cartridges (this includes both rimfire and centrefire semi-automatic handguns). The exception are magazines designed for one calibre that will function in handguns of a different calibre and hold a higher capacity. The RCMP give an example as follows: "Heckler and Koch P7 pistol chambered for 9mm Luger caliber: The magazine designed for the 40 S&W calibre variant of the pistol will hold 13 cartridges of 9mm Luger calibre and function in the 9mm Luger calibre P7 pistol. This is permissible as the maximum permitted capacity of the 40 S&W calibre magazine must be measured by the number of 40 S&W calibre cartridges it is capable of holding, which is 10 such cartridges in the case of the HK P7 pistol magazine." Revolvers have no capacity limits. Magazines designed for centrefire semiautomatic rifles are limited to 5 cartridges. • Magazines designed or manufactured for use in both semiautomatic rifles and semiautomatic handguns are subject to the limit of five cartridges. • Magazines designed or manufactured for use in both semiautomatic rifles and other non-semiautomatic rifles are subject to the limit of five cartridges. "The maximum permitted capacity of a magazine is determined by the kind of firearm it is designed or manufactured for use in and not the kind of firearm it might actually be used in. As a consequence, the maximum permitted capacity remains the same regardless of which firearm it might be used in. Example: The Marlin model 45 (Camp Carbine) rifle chambered for 45 Auto caliber uses magazines designed and manufactured for the Colt 1911 handgun, therefore the seven round and eight round capacities are permitted." • There are specific firearm magazines that are exempted from capacity restrictions under law (see list below). There is no limit on semiautomatic rimfire rifle magazine capacities. However if the magazine is designed for use in both a rimfire semiautomatic rifle and a rimfire semiautomatic handgun the 10 cartridge handgun limit applies. • The 25 round magazine is a prohibited device"
Magazines designed solely for bolt action rifles and shotguns do not have capacity limits. Magazines designed solely for lever action rifles and shotguns do not have capacity limits. 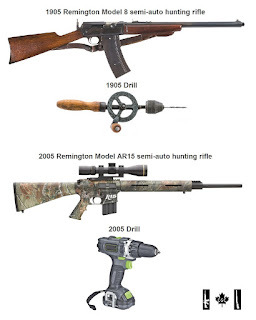 Magazines designed solely for pump action rifles and shotguns do not have capacity limits. • Ammunition belts (metallic or fabric) that are "not a reproduction and was originally designed or manufactured for the purpose of feeding rounds into an automatic firearm of a type that was in existence before 1945". • Magazines that were originally designed or manufactured for use in the semi-automatic Webley&Scott, Model 1912 and 1915"
Video demonstrating how magazine capacity limits serve no purpose.